It’s only natural that the first recipe I post has kale in it. After all, I was really close to naming this blog “Cavorting Kale,” and there will probably be a post one of these days that is an ode to this fabulous, tasty, textured, mineral-rich, alkaline, yet often-maligned veggie. So here you go. If you are not yet a kale convert, start here! 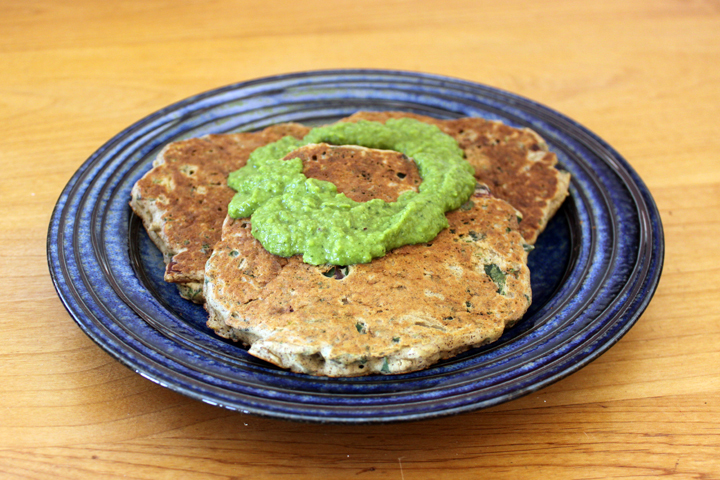 These tasty and nutritious pancakes make a great non-sugary breakfast. I tend to make a batch every Sunday for brunch, then save the extra for snacks during the week. They store incredibly well and can be reheated or just munched on cold. For those aiming to increase the percentage of veggies in your diet, this is also a great way to sneak some in. Melt butter & olive oil in large sauté pan (seriously large, possibly huge, in order to fit all the greens until they cook down). Sauté the onion and garlic until the onion is getting translucent. Add kale and sauté for a few minutes until it wilts. 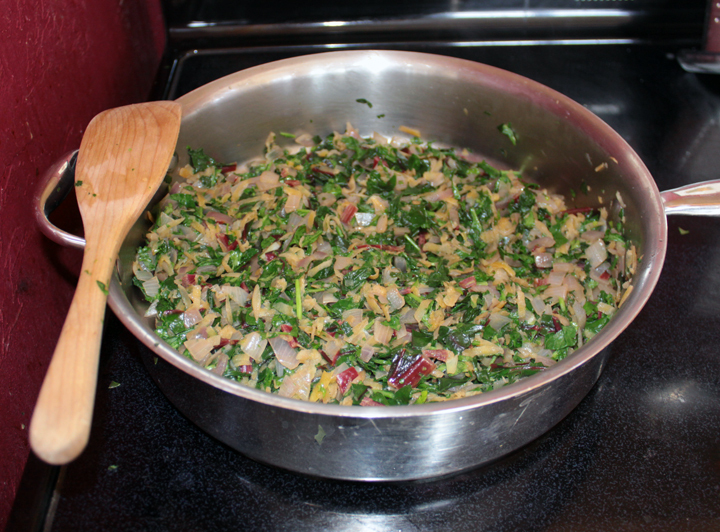 Add other greens, parsley & carrot and continue to sauté until everything is well cooked. (While al dente veggies are great in most dishes, for the pancakes you want to make sure everything is nice and tender. Pay special attention to the kale ribs. Add a little water to the pan if it’s drying out before the kale is tender.) Set aside to cool slightly. In a large bowl, mix together all the dry ingredients. Whisk in the water, kefir, and eggs until well-mixed and there are no lumps. Stir in the sautéed veggies. Batter will be pretty thick, but you can add a smidge more water if it seems too thick. Heat a non-stick griddle on the stove, just above medium heat (after the first few pancakes I generally need to turn the heat a notch under medium). Ladle or spoon the batter onto the griddle and spread out a little to decrease the thickness of the pancakes. When you start seeing bubbles that stay open around the edges of the topside of the pancake, flip. Both sides should be a nice golden brown color and the pancake should be cooked all the way through. Decrease your stove temperature if they’re browning too quickly on the outside but leaving the inside undercooked. Serve with butter and Minty Sweet Pea Sauce or Roasted Red Pepper Sauce. Makes about 20 5” pancakes. -Go nuts with your veggie combos. Add or take away whatever you like, what’s fresh and available from your local farmers, or just what’s sitting in your fridge. Substitute shallots and green onions for the red onion and garlic. Add some shredded carrots instead of some of the greens. Add other fresh herbs. Get crazy! You should generally end up with the cooked veggies representing about 1/3-1/2 of the final volume of the mix. -If following a diet that recommends only using soaked flour, or just if you believe it increases the nutritional quality of flour in recipes (which I do), you can soak the flours in the water and kefir (just stir them all together, cover, and let sit out on the counter overnight). Click here for more on why to soak flours before using them. Add the flax, chia, and other dried ingredients after soaking is completed and you’re ready to make the pancakes the next morning. – This recipe is gluten free and uses only highly nutritious flours from grains that are candida diet approved (therefore, no rice flour, potato starch, or other common gluten free baking ingredients that creep me out, like xantham gum). See my note on specialty flours for more information. It took a lot of experimenting to get the right consistency—nice fluffy pancakes that hold together perfectly. If you don’t have access to one of these flours (and don’t want to order online), feel free to sub in other flours that you like and are comfortable cooking with. But they’re all staples in our kitchen, so I advocate that you track them down and start playing with them. If you leave out the chia or flax for any reason, you’ll need to substitute in another binding agent (tapioca or arrowroot flours would probably work). But considering the great nutritional properties of flax & chia, why substitute anything less good for you and less tasty?? This entry was posted in Breakfast, Recipes, Snacks and tagged Candida Diet, Gluten-Free, Vegetarian by Brooke Bonner. Bookmark the permalink.